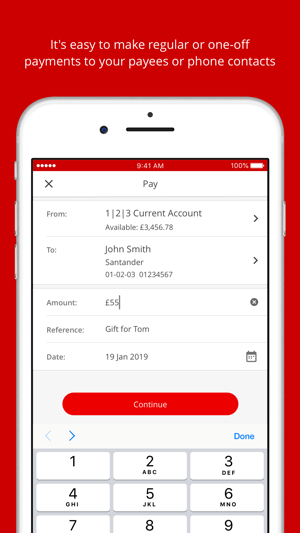 •	Set up the Quick Balance widget on your device’s Today View, and see the balance of your chosen account without having to log on to the app. 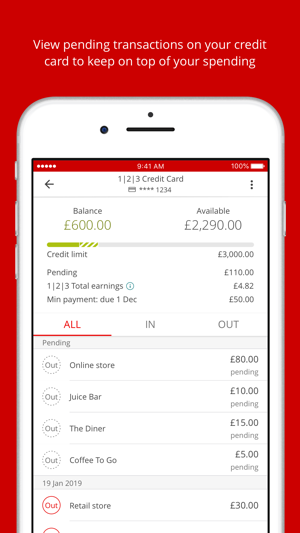 •	Use your app to authorise purchases made online. •	We’ll then ask if you want to set up Touch ID or Face ID to log on. 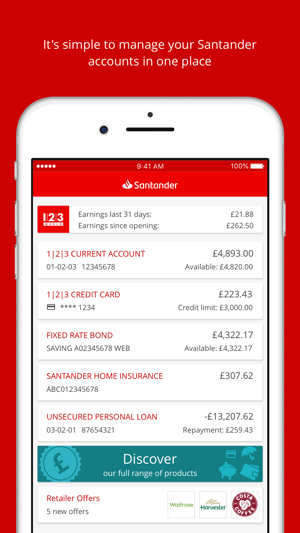 •You can now set up a Quick Balance widget on your device, which will let you see your balance without having to log on to the app. Visit ‘Settings’ in the ‘More’ menu to get started. 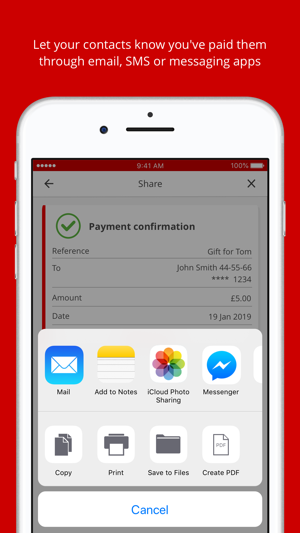 •We’ve redesigned the forms you use to make payments, to help keep you and your money even safer. 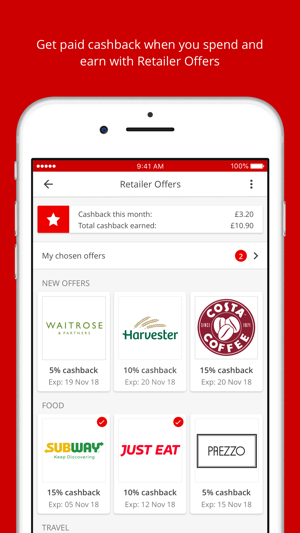 •Where the option is provided by retailers, you will now be able to use the app to authorise online purchases you’ve made using your Santander credit or debit card. 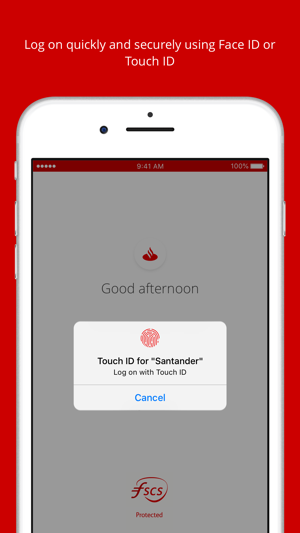 Thanks for using Santander Mobile Banking! 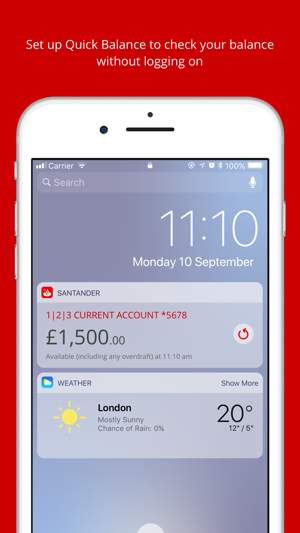 Overseas payments in a day! Sent money to a friend in the States and less than 24hrs it was their account. Awesome! Previous iterations had a way to know how much you have spent during the week or you could just ask the voice assistant. Both now both them are gone and I honestly used them a lot because I always like to know how much I'm spending. Bring one of these two features back please. 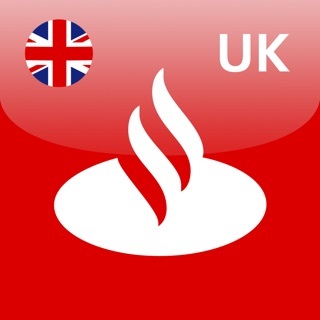 And btw, checking account details have changed location or removed? Add some guide whenever you move things around and it's not easily accessible. This app makes me think too much that bad UI. First, the app is generally slow. Every new screen takes a few seconds to load. It is 2019, there really should be no wait times for an app like this! Second, and most annoying is that the app won’t run if there is update available. This has happened to me several times when I needed to make a quick transaction at a store etc. Please stop tinkering around with this app and just make it reliable!